Since this review was written, the Horseshoe Inn has changed ownership, with the result that what is said here may no longer be current. We hope to be able to update the review in the near future. Dining is at the very heart of the The Horseshoe Inn, and the outstanding quality of what it offers is increasingly making the Inn a dining destination in its own right. Just over 13 miles south of the Edinburgh bypass it is within easy reach of the capital, yet set against the backdrop of the beautiful Moorfoot Hills it could be a million miles away. 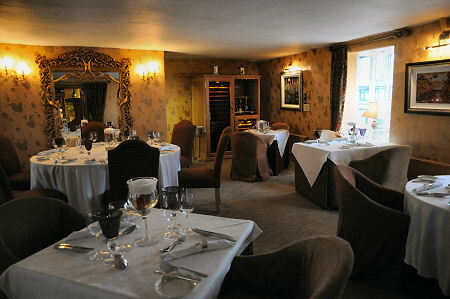 As more and more people discover the amazing dining on offer, booking becomes increasingly advisable: though the range of options available mean that if you are passing by it is still worth calling in on spec, especially during the week, while noting that the Inn is normally closed on Mondays. You can read our hotel review for the Horseshoe Inn here. You can think of The Horseshoe Inn as offering three different dining experiences depending on the time of day and whether you have opted to dine in the Bistro or the fine dining Bardoulet's Restaurant. The Bistro is the more informal option, open at lunch and dinner to offer relaxed dining from a menu that offers excellent food with more than a hint of the fine dining offered elsewhere in the Inn. The food on offer relates to ordinary pub grub in the same way its "Dover sole, Charlotte potatoes, crushed peas and chunky tartar sauce" relates to ordinary fish and chips: you can see there is a connection, but it is a distant one, even if you opt for a side dish of french fries! Lunch in Bardoulet's Restaurant is served from a table d'hôte menu offering three courses with a remarkable combination of quality and value. The menu when we visited offered a choice of two starters, two mains and four desserts including cheese. There is also a classic Sunday lunch menu available in both the restaurant and bistro. Dinner in Bardoulet's Restaurant offers some of the best dining you will find anywhere in Scotland. What makes the food quite so special is the obvious dedication of Chef Director, Patrick Bardoulet, one half of the husband and wife team who run the Horseshoe Inn. He brings to the food a sureness of touch that rapidly convinces you that you could try anything on the menu and be wowed by it. Add in outstanding presentation and a remarkable intensity of flavour, plus great attention to detail and superb service, and you have a dinner that will linger long in the memory. The menus change periodically, so an account of a particular meal is likely to be out of date when you dine. But it is worth relating that the a la carte dinner menu when we visited offered five starters, five mains, and four desserts, plus an assiette of desserts, plus a choice of two cheese dishes. Also on offer was a seriously tempting Tasting Menu, which could be ordered with or without a selection of wines to accompany each course. We chose from the a la carte menu and thoroughly enjoyed the three courses we did order, as well as the canapes, amuse bouches, pre-desserts, and petits fours which added to the occasion and to the range of magnificent food on offer. Breakfast at the Horseshoe Inn is served to residents in the Bistro (or, on a Monday, in your room from a continental tray). We were asked to book a time for breakfast the previous evening, and this, combined with the overall quality of the food served at the Inn and the mouth watering and wide ranging breakfast menu, led us to expect something rather special. We were not disappointed. Suffice it to say that the "fresh fruit salad with lemon balm syrup" was outstanding; that the "organic porridge oats with whisky, dates and muscavado sugar" is probably the porridge they serve in Heaven; that the "brioch French toast, caramelised banana and maple syrup" was delicious; and that the cooked breakfast used great ingredients prepared with care and attention to detail. This was quite possibly the best breakfast we have ever enjoyed. You can read our hotel review for the Horseshoe Inn here.